and Drink Would You Like?" How can I describe the Lake Garda food and drink? All I can say is that the Italain cuisine is absolutely delicious, and a major highlight of our holiday! Your tastebuds will simply delight in the Italian Food and Drink, most of which are locally grown or taken from the Lake. We'll tell you what we thought of the Cuisine and go over the Italian eating customs. We've even got a menu translator to make life easier! You'll find out too about the local wines & vineyards, olive oil, fruit, and of course, the ice cream!! So...Ready for Lake Garda Food & Drink to be revealed? The Italian food is prepared with good quality, fresh ingredients with very little fuss. Each Town on the Lake has it's own variation of ways of preparing each dish, but they all use the same locally grown ingredients. Fresh sun-dried Lake Garda Fish is one of the most popular dishes, and of course pizza and pasta are found everywhere. Did you know that there are over 500 varieties of pasta? 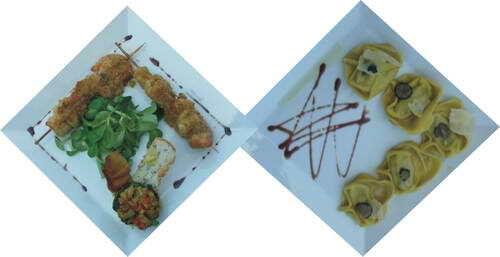 Find out here which types of pastas, pizzas, fish and other meats are most commonly on the menus in the Lake Garda area. Also, find out how German food has influenced the Italian menus at Lake Garda. You going to love the Italian food here! Everywhere you go, every town and village is overflowing with restaurants, cafes, bistros, and ice cream parlours. They all offer amazing cuisine and service. 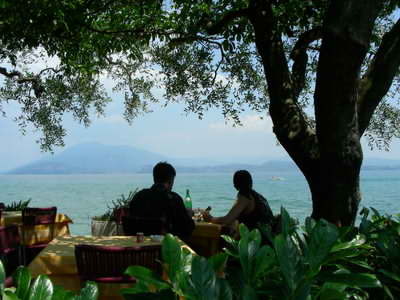 It's difficult to say which we found the best restaurants at Lake Garda, as they are all so good. One thing we noticed though was that if we went to 'out of the way' restaurants that were less 'touristy', not only were they often cheaper, but the food and drink was sometimes even tastier! However, the down side is that sometimes they don't speak English. We somehow got by though with a lot of gesturing and pointing! This especially happened when my dad was with us, as he's quite fussy about how he has his food prepared! When we first went to Lake Garda, the amount of times we wished we could understand what on earth was on the menu....! The restaurants do often have their menus translated into English nowadays, but there are still many that don't...so you're pretty much stuck unless the staff speak English. That's why we've put together this simple Lake Garda food and drink translator with all the basics so you can be prepared to order the right Lake Garda food and drink! Make sure you print it out and arm yourself with it everywhere you go. Did you know that Italians often have a plate of pasta as a starter? Italian eating customs mean meal times are also very drawn-out and centered around the family. Find out why it is rude to rush through a meal, along with other interesting facts about what to expect when you're dining on the wonderful Lake Garda food and drink. The Italians pride themselves in the production of their award-winning wine. The wine in the Lake Garda area is made in various vineyards scattered throughout the area, but it's mostly grown on the eastern shore. Oh, and it's cheap there too, so if you're driving, allow room in the car to bring some back! Find out what kind of wine is made at Lake Garda, and which of the many Vineyards you must see! What types of coffee are found there and what are they like? We all know that Italy is known for its deep, rich coffee, so if you're a tea-drinker you're out of luck because it's very hard to find! My sister-in-law lives there, and whenever my mother-in-law (who LOVES her tea) goes to visit, she always brings a stash of tea bags and her own small kettle! We'll tell you about all the coffees found here and describe each one as best as we can. Also, you probably didn't know the interesting fact that they usually only serve cappucino in the morning... so you'll even find out what time of day each type is traditionally served. Find out more about Italian coffee. Olive oil is used in most of the Italian dishes. One of the best known in Italy is the olive oil found at Garda. It has a reputation for its low levels of acidity and elegant texture. Did you know that there's even an Olive Oil Museum at Lake Garda? Find out more about this essential ingredient and what virgin olive oil is. The local fruit here is so good, really fresh and tasty. Grapes are obviously found around this part of Italy but you also get peaches and nectarines, cherries and kiwi fruit. Lemons, strawberries and oranges are readily available but may be sourced from other parts of Italy. We often go into the grocery stores in the area and load up on fresh fruit to eat at our leisure. We have always found the fruit to be really rich in flavour and the Italians love their local produce. I love the ice cream (known as Gelato) at Lake Garda. Now, I have to note here that I'm not a big ice cream fan in general, but Italian ice cream is the exception! We were all in heaven trying out the delicious flavours, often loaded with fresh fruit...we just couldn't get enough of it! My Dad, who is a bit of an ice cream connoisseur, said it was the best ice cream he's ever had. You'll agree when you try it! The sheer range of types and flavours of ice cream here is staggering! Discover more about the gorgeous Lake Garda ice cream. It's so good we usually get at least one every day in the warmer times of the year. What is Your Favourite Lake Garda Food? Do you love Lake Garda food? Why not share your story about your favourite mouth watering dish and you are highly likely to get your own spot on our website! Your story could well feature on a dedicated web page and may even get in our newsletter too! How good would it feel to show your friends and family your own Lake Garda story on a well respected Lake Garda site! We love pictures as well, so feel free to send us your best shots and there will be no mistaking you then! Please remember we can not receive images larger than 800 X 600 pixels. To check the image size look at the file details or right click the file and click on properties. Most graphics packages allow you to quickly resize your image to any size. You can then save it and upload it here. Remember to keep the aspect ratio the same (there normal is an option to select this), so your picture is not distorted.